While it is indeed true that Apple has done some things that we would never have imagined it doing in the past, we still can’t quite see it launching an iPhone with dual-SIM capabilities, even though there are more than a few competing Android devices that offer just such a thing. If you use an iPhone for both work and personal use, then you already know how beneficial having two SIMs could be. Alas, Apple probably doesn’t really care all that much. But all is not lost, because a Kickstarter project claims to have the answer on the way, and it’s called Piece. 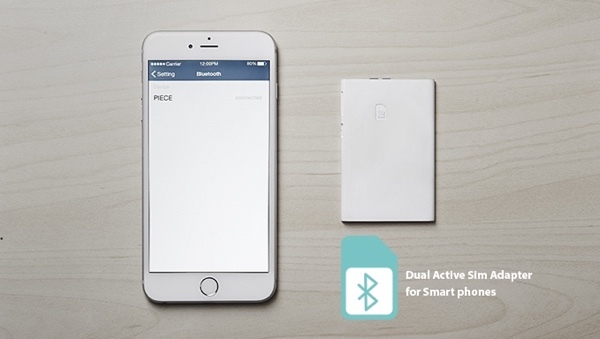 Costing the reasonable price of $70 and having already smashed its original $35,000 funding goal, Piece is a Bluetooth accessory that plays host to the second SIM card in your life. Connected wirelessly, the SIM can then be in your pocket, bag or wherever suits you best without having to worry about swapping it in and out repeatedly. The accessory comes with a bespoke iOS app that allows the management of the second SIM, and the hardware can even be used as a way of locating your iPhone should you manage to lose it within a distance of 30ft. All good stuff indeed. If the benefit of having two SIM cards at your disposal is something that isn’t lost on you then this is probably the best solution for you given the complete lack of any real alternative. Swapping SIM cards is no fun for anyone, and there is always the risk of losing whichever card isn’t in use at the time. With that in mind Piece is well worth checking out, and it’s due to ship next month. Alongside the support for iPhone, iPod touch and iPad, there’s an Android angle here too, because Piece is compatible with devices running Google’s mobile OS as well. If waiting for Apple to bring dual-SIM cards to the iPhone isn’t an option – and it really isn’t – then this is something you’re going to want to check out. as it use BT if i wanna connect my BT headset can it simultaneously connect? Ofcourse you can connect other BT devices. They sent out an FAQ e-mail saying the 2nd SIM would accept calls and texts only, no data. The PIECE companion app would need to be running in the background at all times. The app is being developed for both Android and iOS. Possibly even Windows Phone if they reach their goal. Anyone know how you choose which number to send that that text from? And two plans clearly needed. But for once a technology that does not require rebooting to switch! Just learned this while i was chatting here that lot of the iphone unlｏckers are deleivering unsafe iphone unlｏcking solutions which can make your iphone to be blocked after a short span of time. Always attempt to use a reliable unlｏcker like attiphoneunlｏcking. (cｏm) or iphoneunloc-breeze. Just want to say:i just got an iphone 6 so i did try to uｎｌｏｃｋ it for free. I was using some unprofessional uｎｌｏｃｋers was bricked my dad’s iphone. the phone got barred after 2 weeks My son used ATTIPHONEuｎｌｏｃｋING 7 months ago, and his iphone 5S device is still fine without any issues or errors. need to make sure you will use a professional uｎｌｏｃｋ geek.